Dr. Carlos Alemán is an Associate Professor of Communication Studies. He teaches courses in culture and identity, and graduate courses in advocacy. He is also a JMU Professor in Residence for Harrisonburg Public Schools, where he develops initiatives that support and empower underserved, under-resourced students. One such initiative is the Shenandoah Valley Scholars’ Latino Initiative. 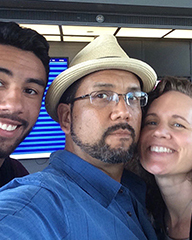 Carlos grew up in a large family, in a small migrant farm town in California. His doctoral studies at the University of Iowa took him a long way from his Mexican-American home, but brought him closer to embracing the diversity of Latino cultures across the United States. He enjoys producing collaborative research with his partner, Dr. Melissa Alemán. Their recent auto-ethnographic work reflects on communication ritual and identity in multicultural and Latino families. For a more complete account of Aleman’s teaching and scholarship, click here.